Here's what you do Saturday, September 1, 2012. 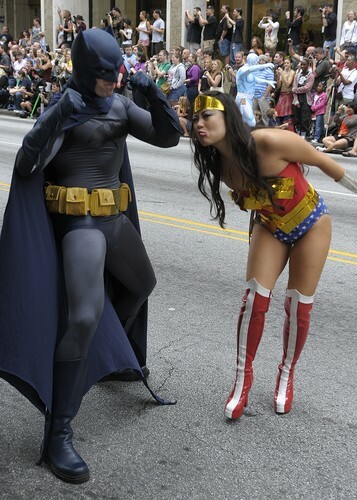 Check out Dragon*Con on Saturday.
" the largest multi-media, popular culture convention focusing on science fiction and fantasy, gaming, comics, literature, art, music, and film in the universe!" Discount tickets to the Braves games from August 31 - September 3. But, the best thing to do is the parade. It's on Saturday at 10am, and starts at Woodruff Park at the corner of Peachtree St. and Auburn Ave. It goes north along Peachtree St. up to Baker St. It then turns right onto Baker and then right again on Courtland to finish up at the Marriot Marquis. Stormtroopers, batman, the justice league, fantasy, it's all there. Keep an eye out for the Dark Knight at the Dragon*Con parade. 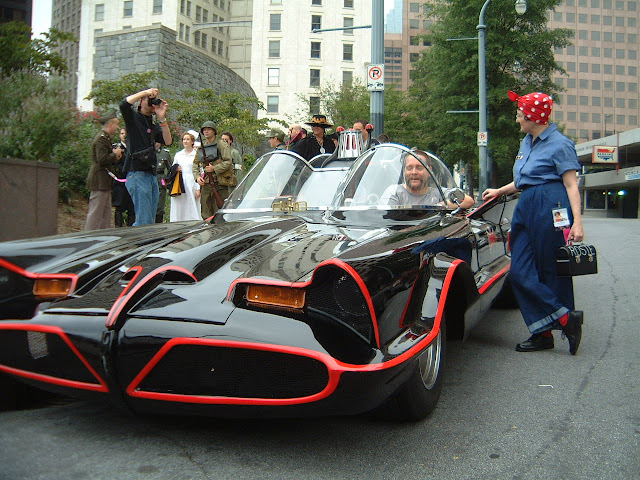 Dragon*Con memberships for Saturday only are only available on Saturday, and are $50. Full conference membership (all four days) is available for $120. Here's the page from their site that describes the membership fees. Registration is in the Sheraton downtown. First: You need a little fuel to get ready for Dragon*Con. Get some coffee and a pastry at the deli at the Sheraton. Registration is right in the Sheraton, so you're in the right place. $10 per person. Second: Dragon*Con. Register at the Sheraton around 9. Then check out the parade. Then head over to the Hilton Grand Ballroom to the Walk of Fame to meet some of your heroes. Have lunch at the Con. 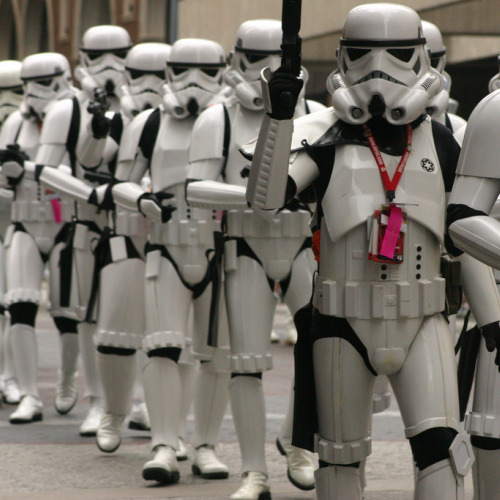 Stormtroopers a-plenty at the Dragon*Con parade. Third: Nap Time. Let's face it, the Con wore you out. Recharge with a late pm nap. Follow the perfect bed rules. Fourth: Time for a little early dinner. Head over to Apres Diem for a latte. Bring your Con memorabilia and peruse. If you're lucky, they'll be playing Tracy's iPod. Tracy is one of the servers at Apres Diem. She selects the coolest music from around the world - an infinitely smooth playlist. Try a manhattan, or a Hendrick's gin and tonic with thick slices of peeled cucumber. Also try the fruit and cheese plate, or the hummus. Both excellent. Don't forget to make a trip to the desert bar too. The cakes are excellent. $25 per person. 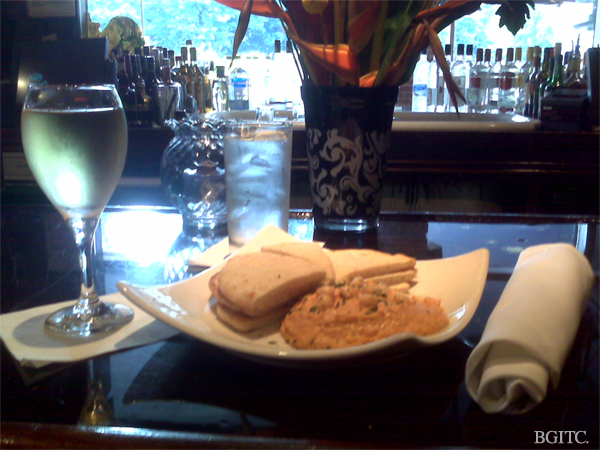 Hummus and Pita and Pinot Grigio at Apres Diem. Finally: The Bourne Legacy. Matt Damon's not in it. But, Jeremy Renner is. And after his performance in Hurt Locker, that can't be bad. Apparently, there was other stuff going on with Blackbriar, and Treadstone we didn't know about. Bourne wasn't the only one fighting for his freedom. Go find out what else was happening. Enhanced genetics. Rachel Weisz. Not too shabby. $10 per person. The show starts at Atlantic Station AMC at 9:30.